Compact 3G / 4G / Wi-Fi Coastal Internet Antenna System with Single Sim. Use your iPhone, Smartphone and PC at sea, up to approximately 15 miles from the coast! 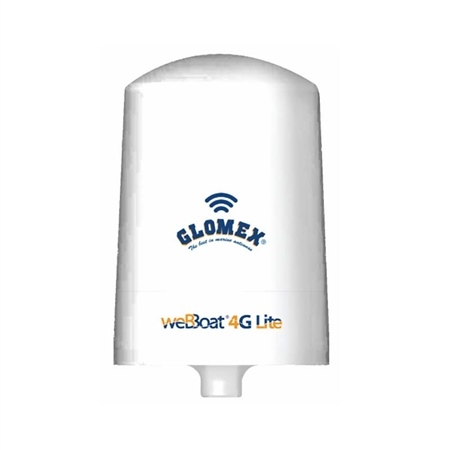 The weBBoat 4G Lite is the new compact version of COASTAL INTERNET 4G/3G/Wi-Fi SINGLE SIM integrated system to surf the web. The system provides the perfect balance between small dimensions and great performance, ensuring stable and high-speed connections up to approximately 15 miles from the coast. The weBBoat 4G Lite is equipped with two 4G/3G diversity antenna, one diversity Wi-Fi antennas, an internal single SIM card slot, and a super-fast 3G/4G/Wi-Fi router that creates a hot spot on the vessel. Up to 24 different devices can be used simultaneously without any degradation to the signal or performance. The units built-in advanced switching software allows the user to save money on costly roaming and overage charges by automatically switching to Wi-Fi when available. The weBBoat 4G Lite is a true Plug & Play device that requires minimal setup and only one power lead for the antenna which operates from 10-30 Vdc. Most importantly, all functions of the unit are controlled by the app which is available for both Android and iOS devices.